Female filmmakers: Investigating their works, history and advocacy in the U.S. from 1896-present. Of course she is most famous as the first and as of the writing of this post (which hopefully becomes obsolete soon) the only woman to win a Best Director Oscar for her film The Hurt Locker (2008). 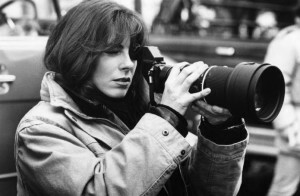 KATHRYN BIGELOW earned her Master’s in film at Columbia where she studied criticism and theory and finished a short film The Set -Up (1978) which deconstructs the violence in cinema with a soundtrack of philosophy paired with visuals of two men engaged in a fight. That short informed her subsequent work – and her first feature film after winning the Oscar Zero Dark Thirty (2012). Her artistic abilities were aided by her marketing savvy early in her career which can be demonstrated with films like Near Dark (1987) a vampire-western which Bigelow pursued because she had a desire to make a Western but knew that vampire films were popular at the time. More to add to this “bite-sized blog” – please send us a comment!